NEW - We have a litter of Great Pyrenees pups that will be available the first week of February. Check out our sales page for more info! Welcome to the Shiloh Prairie Farm website, we hope that you will take some time, look around and get to know us and our farm better. We raise Boer and Nubian goats and sell quality, handcrafted goat milk soap. We use Great Pyrenees livestock guardian dogs to protect our herd from the numerous coyotes and other predators living near us. Our farm is located in southeast Kansas just East of Chanute and North of Erie. Our farm is only about 75 to 130 miles from Joplin, Springfield, Tulsa, Wichita and Kansas City. We are not far off the highway and our farm is easy to find, so why don't you give us a call and set up a time to come visit! Kansas Boer Goats. We keep a relatively small herd of about 25-45 Boer, Nubian and percentage Boer goats depending on what time of year it is. By keeping our herd small we can concentrate on quality over quantity and ensure every goat gets the best of care. We raise and offer for sale percentage, purebred and a select few Fullblood Boer goats for breeding stock, 4h projects as well as naturally raised meat wethers. We strive to breed healthy, productive goats that are also colorful. 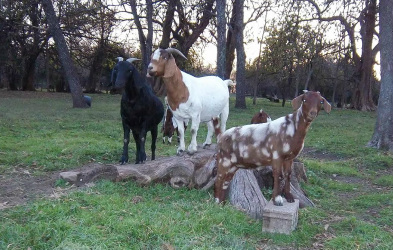 Our herd consists of paints, solid reds, blacks, as well as black headed and traditional colored Boer goats. While we do love our colored Boers, herd health and productivity are our first concerns. We often have both kids and adult goats available on our Sales page. Available Soon! Shiloh Prairie Goat Milk soap starts with fresh, pasteurized and chemical free goat milk from our own wonderful Nubian dairy goats. Why goat's milk? Because goats milk is rich in proteins, vitamins and minerals. Then we add olive oil, shea butter and other natural oils to create a truly lovely, moisturizing soap. Each bar is handcrafted and hand cut with care. Relaxing Lavender, rich honey oatmeal and the all natural fragrance free bar are just some of the lovely soaps available. Why not check the soap shop out now to see what else is there? No pictures or part of this website is to be used without consent.